Welcome to Bloodborne month! 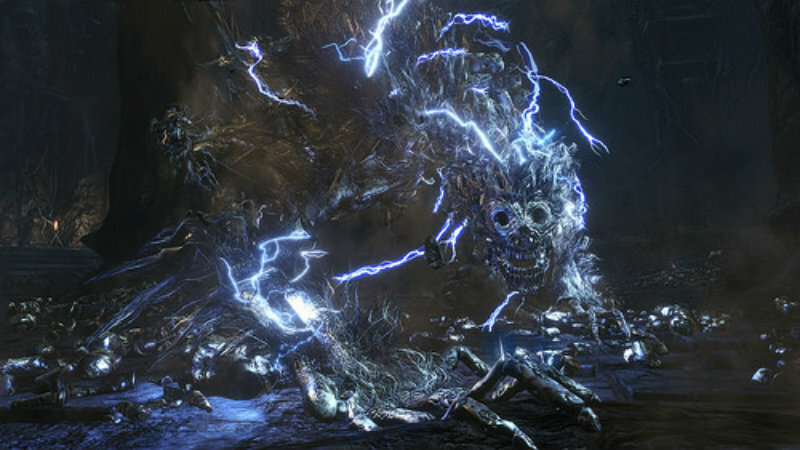 The latest From Software game that seeks to destroy your soul will be releasing in just a few short weeks. In the most recent video, we get a glimpse of a most macabre boss battle that might just be the best enemy design we’ve seen thus far. Here is the last video from IGN’s exclusive Bloodborne reveals. This doesn’t mean it’s the last bit of news we’ll be seeing about the game, but from now on it won’t be via IGN. And here’s a non-YouTube version for those who need it. What is that Darkest? Obviously it has some strange electrical power, but it looks totally bizarre. According to the PlayStation Blog, no one is really sure what it is. A malformed beast enveloped in blue lightning. With a long body made of only bones, and a wrinkle-covered skull, people say this beast must be very old, very ancient. Or perhaps, it is a descendent of the city of the plague of beasts. I really enjoy these designs for boss battles. They just feel so epic and intimidating. Of course, I’m too much a wimp to take this guy on alone – I would totally learn the lay of the land by offering myself up for co-op first, and then demand some co-op help when I actually take him for real. He looks like a real challenge, although I’m sure there will be guides and cheats for him before the game is even released. Bloodborne doesn’t seem to rely as much on cheating the system – no more quirky pillar hides for easy kills. Still, there must be some way to make this boss battle easier… right?